Press Release information you can use! The following information is provided by the travel supplier or its public relations representative. The Traveler's Journal can accept no responsibility for the accuracy or validity of any material in this section. Holidays are a lot more fun when you can share them with your best friend. 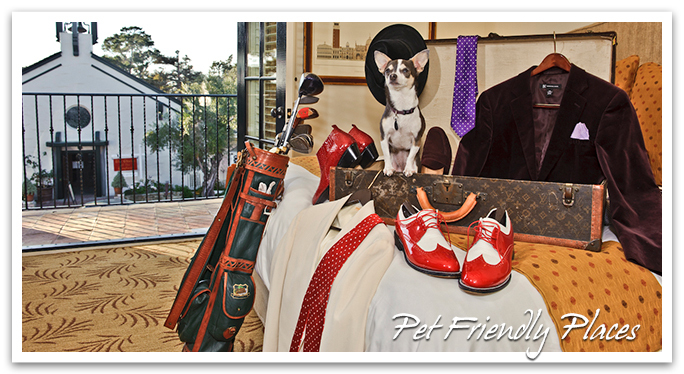 Many Unique Inns welcome well behaved pets and even offer special amenities to help four legged family members feel right at home. Have fun taking your pets with you wherever you go!! FivePine Lodge welcomes your dogs and even cats and strive to make their accommodations as comfortable as possible for all. Upon check-in, your dogs will get a welcome treats. $25 fee per night for guests with pets. The Shelburne Inn is pleased to provide fine accommodation for dog owners in one room of their main house for an additional $15 per night. There is no size limit for dogs. So, come experience beautiful Long Beach without having to leave your four legged love one at home. Includes breakfast in bed daily, two $20 chips redeemable at pet friendly Terry’s Lounge Yappy Hour, embossed dog tag, dog mat, pet blanket and bowls, unlimited treats and $10 donated in your name to the Duffy Day Lifesaving Program benefiting animal rescue and adoption. Share the beauty and peace of the lake with your furry travel companions! The Lodge welcomes pets and has several designated pet friendly cabins. A small additional fee is required. Doggie stations are located around the resort and staff gladly assist with recommendations for local dog friendly parks. This Month's Testimonial: “Highly Recommend Groveland Hotel"